ASHLAND — The Museum of the Bible opened its “Adornment” exhibit at Ashland University has opened and the exhibit will run through April 14. The exhibit, which is free and open to the public, will display approximately 40 items, including such things as manuscripts, early printed Bibles, paintings, woodblocks and prints. The display will be located in the Hawkins-Conard Student Center conference rooms and will be open from 8 a.m. to 5 p.m. each weekday and Saturday from April 2-14. The Student Center is located at the corner of King Road and Claremont Avenue. The Ashland exhibit will be titled “Adornment: Art of and About the Bible” and its objective is to expose the public to the beauty that adorns the Bible, to emphasize the importance of this book to artisans throughout history, to display beautiful creations meant to honor the Bible and to educate people on the purpose for pictures in Bibles. The process of illustrating and adorning the Bible is a challenge that has attracted many of the most famous artists throughout history. Though the style of the art changes depending on the time and places in which it was made, the scenes depicted – and the themes conveyed – remain familiar. Campo serves as a member of the board for the Museum of the Bible located in Washington, D.C. This exhibition contains beautifully illuminated manuscripts from the Middle Ages, intricately engraved Bibles from the Renaissance, fore-edge painted Bibles from the Victorian era, and an array of spectacular bindings. 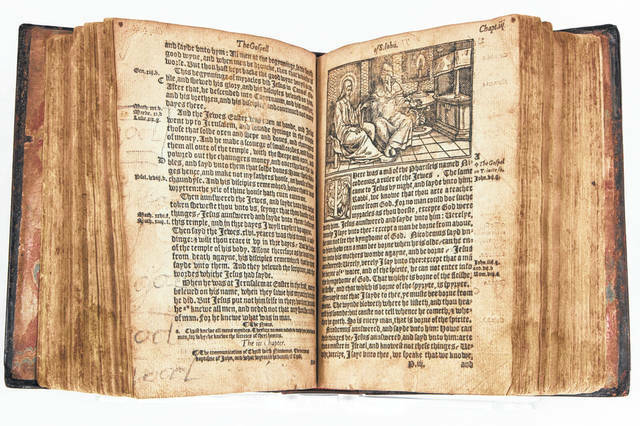 Some highlights include: a Medieval Psalter, a Missal for use of St. Julian of Tours, the Speculum (or Mirror of Human Salvation), the Nuremberg Chronicle, an early Tyndale New Testament, the first printed and illustrated Gospel Book in Arabic, paintings by Harold Copping, lithographs by Salvador Dali, and more. The highly anticipated grand opening of the 430,000-square-foot nonprofit Museum of the Bible in Washington, D.C., located just two blocks from the National Mall and three blocks from the Capitol took place in November 2017. The exhibit in Ashland is the first stop on the museum’s traveling circuit in 2018. Beyond domestic showings, the Museum’s exhibits have already traveled around the world. Stops include two separate appearances at Vatican City’s Braccio di Carlo Magno; the Havana Cathedral in Havana, Cuba; the Pontifical Catholic University in Buenos Aires, Argentina; the Lichthof of the Ulmer Museum in Ulm, Germany; and The Bible Lands Museum in Jerusalem. Ashland University is a mid-sized, private university conveniently located a short distance from Akron, Cleveland and Columbus. Visit www.ashland.edu for information. Courtesy photo The Museum of the Bible opened its “Adornment” exhibit at Ashland University today and the exhibit will run through April 14. The exhibit, which is free and open to the public, will display approximately 40 items, including such things as manuscripts, early printed Bibles, paintings, woodblocks and prints. https://www.galioninquirer.com/wp-content/uploads/sites/38/2018/04/web1_GC.BIB_.000834_001_o3_preview.jpegCourtesy photo The Museum of the Bible opened its “Adornment” exhibit at Ashland University today and the exhibit will run through April 14. The exhibit, which is free and open to the public, will display approximately 40 items, including such things as manuscripts, early printed Bibles, paintings, woodblocks and prints.